Deep within a riverine forest minutes from Jomo Kenyatta Airport, Wilson Airport and Nairobi City is a true wilderness experience. Visitors can arrive into Kenya and get 'straight under canvas' within 30 minutes of leaving the airport. 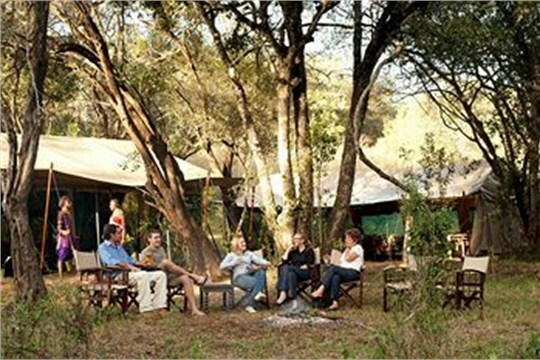 Nairobi Tented Camp is an authentic tented camp in the heart of Nairobi National Park. The camp consists of eight luxury en-suite tents, as well as elegant dining and living areas, comfortably nestled in a beautiful olive and croton forest in the Kisembe Valley. Being close to both the wilderness and the city, our camp is truly one of a kind, an ideal location that offers something for everyone. Airport transfer from Nairobi Jomo Kenyatta International airport or Wilson airport to Nairobi Tented Camp or trasfer from Nairobi Tented Camp to Nairobi Jomo Kenyatta International airport or Wilson airport.